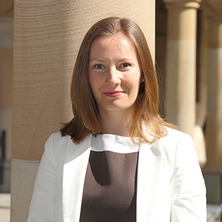 Dr Barbora Jedlickova joined the TC Beirne School of Law as an Associate Lecturer in 2011. She specialises in competition law and is interested in comparative competition law, competition-law theories and competition law in the digital economy. Her research has focused primarily on vertical restraints; bargaining power; and economic and jurisprudential theories and arguments in competition law. Her research also includes analysis of specific markets with distinctive issues such the grocery retail market, the pharmaceutical market and the telecommunications market. Her publications include a research monograph Resale Price Maintenance and Vertical Territorial Restrictions: Theory and Practice in EU Competition Law and US Antitrust Law published by Edward Elgar Publishing and a joint article on legal theories in anti-cartel law published in the Federal Law Review. Dr Jedlickova’s engagement and research are both nationally and internationally orientated. She has visited several European and US institutions as a visiting scholar; including the University of Iowa, Boston University and the Court of Justice of the European Union. She is a member of a number of national and international associations. She is an active member of the International League of Competition Law (LIDC) and has been involved in three international LIDC projects. Dr Jedlickova is a Fellow of the Centre for Public, International and Comparative Law (CPILC) and a Fellow of the Australian Centre for Private Law at the TC Beirne School of Law. She manages one of the CPICL’s research programs and has severed as a General Editor of the LAWASIA Journal. Dr Jedlickova holds degrees from the University of Glasgow in the UK (PhD in Law, 2012; and LL.M. with Commendation in International Competition Law and Policy, 2007) and from Masaryk University in the Czech Republic (2004). Prior to her academic career, she worked as a Lawyer in the Czech Republic and as a Contracts Officer/Assistant Contracts Manager at both the University of St Andrews and the University of Glasgow in the UK. In 2009, she was a trainee (a blue-book 'stagiaire') of DG Competition at the European Commission in Brussels. Journal Article: What's Wrong with Cartels? Jedlickova, Barbora and Crowe, Jonathan (2016) What's Wrong with Cartels?. Federal Law Review, 44 3: 401-418. Jedlickova, Barbora Resale price maintenance and vertical territorial restrictions : theory and practice in EU competition law and US antitrust law. Cheltenham, United Kingdom: Edward Elgar Publishing, 2016. Jedličková, Barbora (2015) Vertical issues arising from conduct between large supermarkets and small suppliers in the grocery market: law and industry codes of conduct. ECLR: European Competition Law Review, 36 1: 19-29. Competition law regimes of many developed countries, including Australia, have been increasing penalties for cartels and/or criminalising such conduct. This encourages entities involved in collusive behaviour to achieve consensus through indirect means to avoid a possibility to be caught by a competition authority. It is important therefore for courts and competition authorities to distinguish between cooperative oligopoly and natural oligopoly and to interpret evidence correctly. This potential PhD thesis should/could include not only analysis of a cartel regime but also a study of the most recent (and older) economic theories and existing and potential legal theories to establish boundaries between illegal and legal conduct and argue the correctness of an approach to horizontal collusion. This topic could include a comparative study or it could even be a pure empirical study. Jedlickova, Barbora (2018) Beyond the economic approach: why pluralism is important in competition law. The University of Queensland Law Journal, 1 37: 41-56. Jedlickova, Barbora (2013) Vertical Agreements in EU Competition Law by Frank Wijckmans and Filip Tuytschaever. European Law Review, 38 280-282. Jedlickova, Barbora (2012) One among many or one above all? The role of consumers and their welfare in competition law and policy. ECLR: European Competition Law Review, 33 12: 567-574. Jedlickova, Barbora (2009) Book Review of Cases in European Competition Policy: The Economic Analysis by Bruce Lyons. Competition Law Journal, . Jedlickova, Barbora McCabe (2008) Boundaries between unilateral and multilateral conducts in vertical restraints. ECLR: European Competition Law Review, 29 10: 600-607. Jedlickova, Barbora (2018). Introductory speech: Reflection on Pluralistic Strategy and Holistic Assessment: Why Pluralism is Important in Competition Law. In: Symposium 'Cartels, Optimal Enforcement and Theories in Competition Law', Brisbane, Australia, (). 27 March 2018. Jedlickova, Barbora (2017). Australia’s telecommunications industry: from monopoly to competition. In: Competition Law and Telecommunications: Key Regulatory Challenges, Hong Kong, (). 23-24 March 2017. Jedlickova, Barbora and Crowe, Jonathan G. (2014). What's wrong with Cartels?. In: Public And/or Private Lives, 2014 Law and Society Association of Australia and New Zealand Conference, Brisbane, Australia, (). 3-5th December, 2014. Australian and US Developments of Competition Law and RPM: Who Is Right? Jedlickova, Barbora (2012). Australian and US Developments of Competition Law and RPM: Who Is Right?. In: Seminar Series, Centre for Regulation and Market Analysis, Adelaide, SA, Australia, (). 8 March 2012. What Is and What Should Be the Objective of Competition Law? Barbora Jedlickova (2012). What Is and What Should Be the Objective of Competition Law?. In: School of Law Seminar Series, University of South Australia, (). December. Jedlickova, Barbora (2011). Competition and RPM: Lessons from US and Australian Historical Development. In: The 30th Annual Conference of the Australian and New Zealand Law and History Society, Brisbane, Australia, (). 12-13 December 2011. What Should We Know About EU and US Approaches to Resale Price Maintenance? Jedlickova, Barbora (2011). What Should We Know About EU and US Approaches to Resale Price Maintenance?. In: The TC Beirne Law School Research Seminar Series, Brisbane, Australia, (). 07/10/2011. Theory of Services in US Case Law on RPM: Reality or Theory? Jedlickova, Barbora (2010). Theory of Services in US Case Law on RPM: Reality or Theory?. In: CCP Summer Conference 2010 (New Researchers' Workshop), University of East Anglia, Centre for Competition Policy, Norwich, UK, (). 17-18 June 2010. Jedlickova, Barbora (2009). The Cooperation Between the Commission and the National Courts - A Black Sheep of the Success of Regulation 1/2003. In: XIVth Competition Law Scholars Forum Workshop, London, United Kingdom, (). 10 September 2009. The Objective of Competition Law: Protection for Consumers or Protection of Competition? Jedlickova, Barbora (2009). The Objective of Competition Law: Protection for Consumers or Protection of Competition?. In: International Graduate Legal Research Conference, London, United Kingdom, (). July 2009. Jedlickova, Barbora (2018, June 08). Criminal charges against banking 'cartels' show Australia is getting tough on competition law. The Conversation, . Jedlickova, Barbora (2012). The law of vertical territorial and price restraints in the EU and in the USA: a critical analysis of vertical territorial and price restraints - an argument against legalisation PhD Thesis, School of Law, University of Glasgow.